Madrid is a versatile city with something for everyone. If you like history, don't miss the old town, but if you prefer art, you'll love the city's many museums - and if you're a football fan, the Santiago Bernabéu or Wanda stadiums are a must. Enjoy the Spanish capital's old town, museum district and several shopping areas, all just a few minutes from the hotel. 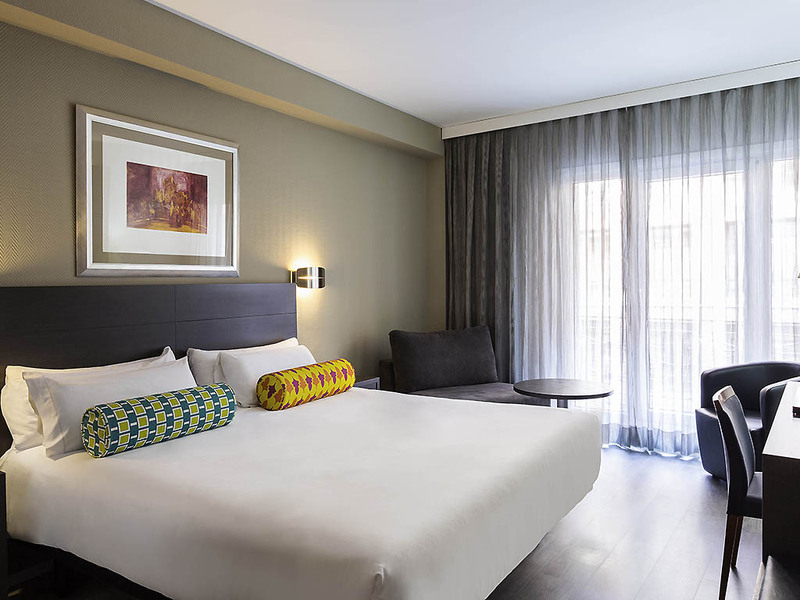 The hotel is ideally located if you're arriving by train - the Atocha train station is just a stone's throw away. Personnel makes up for other deficiency.Rooms can be improved,amenities can be replenished better and consistently. Good clean hotel with good staff could do with a bar and restaurant, could do with better signs on outside as we had an awful job to find it as we walked from train station and we gave half the day searching for it ,you can’t really see it from Main Street below because. Of trees etc. Anybody we asked and there were plenty did not know where it is. We eventually stumbled on it at about 4.00pm after arriving at train station approximately 10.00am. Excellent in itself, very good reception service, very friendly and correct treatment. This hotel is conveniently located to the Prado Museum, Gardens and a short 15 minute walk to Plaza Mayor. There are many restaurants nearby. The breakfast was more than adequate and was a good start to the day. Reception staff were very knowledgeable, particularly Nicole, and the young lady at breakfast time was very helpful.. We were very happy with our room. We spent 5 nights here and would recommend to anyone to use as a base for sightseeing Madrid. Great Quiet Location to sightsee from. 5 mins to Prado Museum - 15 min to Plaza Mayor. Restaurants nearby. Excellent staff only too willing to assist you and advise re sightseeing. Hop-on Hop-off buses 5 mins away. Very Good and the location is superb! I enjoyed my stay at the hotel. The location is great, the breakfast is awesome, the room was nice. The bathroom could have been cleaner & nicer and there was no hair conditioner or washclothes in the bathroom. Other than that, it was good. Not as I expected. Although I had done online check-in previously, still had to wait and do the check-in at the hotel due to lousy customer service at the reception. The staff was very good and we were greeted warmly on check in. Mey was very helpful and made our stay memorable by booking restaurants and suggestions. The room (706) was very nice. Just a few notes: the drain on the tub would not close so we could not take a bath. We reported the sliding door would not lock and it was eventually fixed. Reception was fine. The Junior Suite with the large terrace was absolutely amazing, the accommodation very spacious with some TLC / updating maybe needed - but really a gasp producer. Unfortunately, even though such circumstances can indeed happen and are out of our control, the issues with the lack of hot water dampened the appreciation of the stay to the extent that 1) communications about it was very poor and 2) the solution - although somewhat appreciated - was far from ideal (going to another hotel unwashed/kept about 6 minutes' walk away in an obviously lower standard room type). To be honest, with that kind of let down I would have expected a discount to be offered without asking. The breakfast room is a bit dark so I was glad I just enjoyed my own breakfast on the sunny terrace. It was okay, but please advise your customers arriving with their own car about the policy of Madrid with respect to vehicles. I was really astonished that my car was hacked by the police because I entered the Calle Lope de Vega. We had a pleasant stay in Madrid. Lots of restaurants nearby. Room was fine. The complimentary box of candies was lovely as I’m a lollie junkie!!! And the water!!! We are very satisfied with the Mercure. Thanks to the location, we were able to reach most of the attractions we visited on foot. The room was spacious, clean and well equipped (including fridge and coffee/tea facility). The bed was to our liking: soft and supportive. We didn't need to use the soft pillows we had brought from home in Finland. The balcony was a nice surprise. We were politely greeted by the staff every time. The breakfast was varied, plus very good omelettes free on order. Lunch open from 7 to 11.30 -> a chance to sleep long; not crowded. 1. No Hot water, 2. Simple excuse with a bunch of candies 3. No return back for the availability of massage service 4. Price to performance not worth it.